Egypt Analysis: Is Obama Really Interested in Promoting “Democracy”? In his commencement address at West Point on May 28, President Obama said US policy towards Egypt should balance co-operation on counter-terrorism and national security with pressure for political reforms. The Administration’s reaction to the recent election of Egyptian strongman Abdel Fattah al-Sisi as President, in what observers characterised as a political atmosphere of “pessimism, self-censorship, and fear”, will indicate whether the President gives equal priority to both of these objectives — or if the Administration will continue to use the rhetoric of “democracy” as a cover for the pursuit of short-term national security interests. 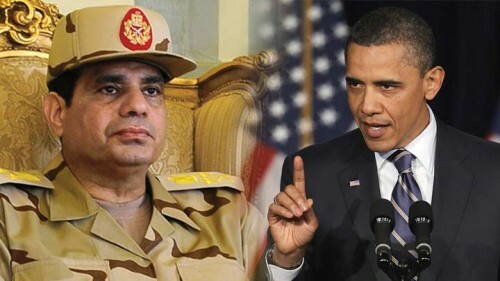 The July 2013 military coup, which removed President Morsi and replaced him with a military-backed transition government, crystallised long-standing disagreements in Washington between the Executive, Congress and the wider US community of “democracy promotion”. How best to create a stable government to safeguard US interests in the country? The Obama Administration has supported the transitional government and Sisi, believing that they represent a stable ruling elite which will maintain peace with Israel and Egypt’s strategic relationship with the US and will implement counter-terrorism measures. In contrast, members of Congress and the democracy-promotion community argue that, unless a more legitimate and inclusive system is created, opposition to the Egyptian Government is likely to grow, destabilizing the country and possibly leading to an Algerian-style insurgency. These tactical disagreements have played out in clashes over the annual appropriation to Eygpt of $1.5 billion in military aid, which it has received since signing the Camp David Agreement with Israel in 1979. After strident calls for a cut-off following the July coup, the administration quietly suspended the assistance but did not invoke a US law requiring a ban. In January, Congress passed an appropriations act which would allow aid to be resumed, if the Administration certified that certain conditions were met. Firstly, Egypt had to maintain its strategic relationship with the US and its peace agreement with Israel. If the second condition was met of a referendum on an Egyptian Constitution, Congress would disburse $975 million in military and economic aid. Finally, if the Egyptian government held Presidential and Parliamentary elections and took steps to govern justly and democratically, a further $575 million would be disbursed. *The banning of political organisations opposed to the Government. While stopping short of alleging fraud, Democracy International complains of the “troubling presence” of military and police personnel within polling stations on Election Day and unreasonable obstacles put in the way of international and domestic election monitors. While the election was not free and fair and the “transition to democracy” is facade rather than substantive change, the US could accept this outward display and maintain co-operation over national security issues. However, this would not solve the long-term problem of growing popular disillusionment and radicalization which could erupt into wider terror campaigns or even an insurgency. The Working Group on Egypt, a coalition of members of the US foreign policy elite interested in democracy promotion, has an alternative proposal. It suggests that the Administration refrain from certifying the election and then restructuring aid to Egypt, reducing assistance to the military and targeting the remaining aid on the counter-terrorism mission, improvement of the economy, and support of democratic groups in Egyptian civil society. This policy could build up social and economic sectors likely to support democratic change, while gradually reducing the influence of the military. No decision on the disbursement of US aid has been made; however, there are already indications that the administration will accept Egypt’s flawed electoral processes at face value to preserve national security interests. The State Department congratulated Sisi on his victory, while making mild criticisms of the process and urging the new Government to implement reforms before the Parliamentary ballot. That approach is similar to US Government statements after Egyptian elections in 2005 and 2010, and well as the Constitutional referendum in January. With no consequences for non-compliance, Egypt’s rulers uniformly ignored these appeals. And just as it did not punish the Mubarak regime, Washington did not press any demands. In April, the Administration released ten Apache helicopters, withheld since the July 2013 coup, for counter-terrorism operations in the Sinai Peninsula. Egypt’s “transition to democracy” is a sham conducted to secure domestic legitimacy for the regime and open the aid spigots in Washington. Obama’s “democracy promotion” is mild rhetorical support for democratization while Administration pursues its primary objective of the US-Egyptian strategic relationship. Based on the President’s track record, strong pressure from Congress will be needed to shift policy towards a strategy of genuine pursuit of democracy, seeking to preserve Egypt stability and safeguard US interests in the long term. And that, given a far from united legislature, is far from likely.